Anyone else have a bit of a problem with letting clutter pile up? Whew, glad I’m not alone. 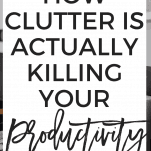 Clutter isn’t just visually unappealing, it’s also a huge productivity killer (probably more than you realize)! 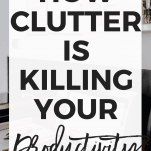 Here are a few ways clutter is killing your productivity and how you can fix it. It Kills Your Focus: Whether it be physical, digital, or mental clutter, it can seriously kill your focus. For me, mental clutter is the biggest culprit here, and I find it super hard to focus when I have a lot on my mind. For others, it might be physical clutter and not being able to focus on the task at hand when they see the stack of papers and office supplies piling up. It Stresses Us Out: Am I the only one who tends to get a bit stressed when I’m surrounded by clutter? I’m guessing not. In part, it’s stressful because I take a look at my workspace and realize how much work I have to do decluttering. But it also stresses me out to maneuver around it and realize how much it hinders my productivity. It Slows Us Down: It’s amazing how a bit of clutter (or a lot of clutter) can make a simple task take so much longer than it needs to! 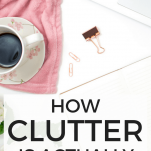 Whether it be trying to maneuver around physical clutter or trying to find a file that you cannot remember where you saved, clutter causes us to waste a lot of unnecessary time. There is more than one type of clutter! Physical clutter, digital clutter, and mental clutter are something that all of us likely struggle with at some point. All three, however, are hindering your productivity. We’re all familiar with physical clutter. Chances are if you look at your desk or office, you’re going to find a lot of it. I try to keep my desk cleaned off, but every few days papers and files start to pile up and the clutter suddenly becomes overwhelming! This type of clutter is the most obvious, which luckily means it’s usually the easiest to tackle as well. Identify the Essentials: Take a quick look around your desk. 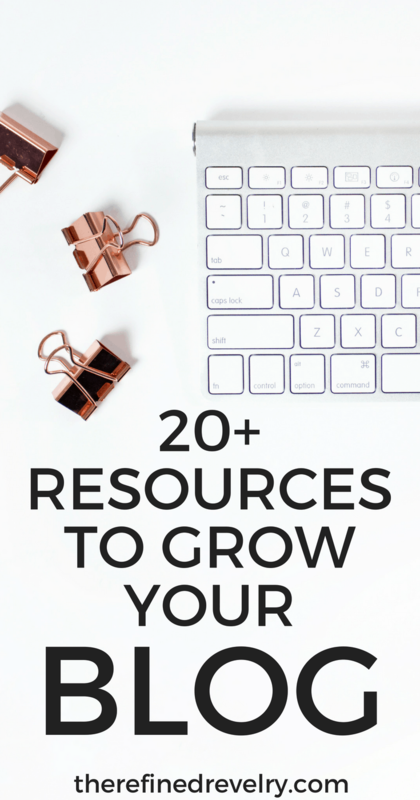 Chances are, not everything you’re looking at actually needs to be on your desk. Try to limit the things taking up surface space on your desk to things you actually use just about every day. Everything else can go in a drawer, in a folder, or somewhere else where you can access it when you need it, but not allow it to take up precious desk space. Give Everything a Home: Anything that is going to be sticking around your home or office for more than a few days definitely needs a home! In the past, I’ve been guilty of having surfaces covered in stuff just because I didn’t really have anywhere in my home to keep them. But finding a permanent home for everything makes it super easy to quickly declutter because you know exactly where everything needs to go. Consider Going Digital: I’m a pen and paper kind of person and when I’m reading something lengthy like an eBook or a report, I love printing it out so I can highlight and make notes. Because of this, I can definitely relate to feeling like you need to keep the physical paper copies of everything. But you don’t! Even if you consume information best with paper and highlighter in hand, that doesn’t mean you have to hang onto it forever. Whether it be work papers, educational materials that you’re reading for your business, or bills that you’re getting in the mail, you can easily scan those and store them digitally so they aren’t taking up space in your home or office. Build in Time to Declutter: Clutter can build up in my workspace pretty quickly, so I always build a time into each week to tidy up. Usually, I do this on Friday afternoons after I head home for the week so that my desk is clean when I sit down to work on Monday morning. 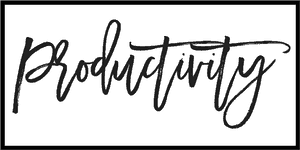 As for my workspace at home, I add a task on my calendar on the weekends to clear off my blogging space so I’m not being distracted by the clutter that builds up. Just 15 minutes each week to figure out what needs to be kept and what doesn’t, and to find a home for everything, can make a big difference in boosting productivity. In theory, being able to keep everything digitally seems like a great solution to clutter all on its own. However, if you’re not careful, it just gives you another type of clutter to deal with! So many of us just fill up our hard drives or cloud drives with files that really aren’t organized with any rhyme or reason. Photos, important documents, and so many other things are all thrown together without any organization, and this clutter can seriously add up! Come Up With a System: While storing your files digitally is a great step toward decluttering, you’ll then have to come up with some sort of system to keep all of those files organized. If your computer desktop is a mess of pictures and documents ranging from business to personal, you’re not alone. And finding a way to organize those files in a way that works for you is a big step in helping you to stay productive. The first thing I do is create folders for personal, business, and work. From there I further organize into folders. 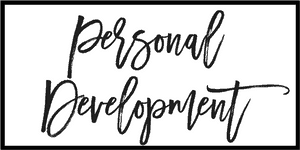 For example, my business folder is broken down into folders for blog posts, Etsy products, finances, and more. Everything is meticulously organized in a way that I know I can quickly find any file I might be looking for. Everyone’s system is going to look a little different, but it’s all about finding the process and tools that work for you, whether those tools be your computer hard drive, Google Drive, Dropbox, or something else. Tackle Your Inbox: For most of us, our email inbox is probably one of the biggest offenders when it comes to digital clutter. I’ve got three to keep up with (work, personal, and blog) and it seems like whenever I make progress on them, things just pile up again! One way I limit the distraction of my inbox is limiting the number of times I check my email. If I have my email open all the time, I’m going to let each and every new email distract me from what I’m working on. Instead, I look at email as its own project and tackle all of them at once. Another way I cut down on the distraction in my inbox is by dealing with emails right away when I open them, rather than letting them sit there already read to be dealt with later. Most are things that I could handle right away, so I would rather not put off those tasks unnecessarily. Mental clutter is the least obvious form and something you might not even generally think of as “clutter”. However, having too much clouding your mind can get in the way of productivity just as much as physical or digital clutter. It’s also the one that is likely the most emotionally and mentally draining. 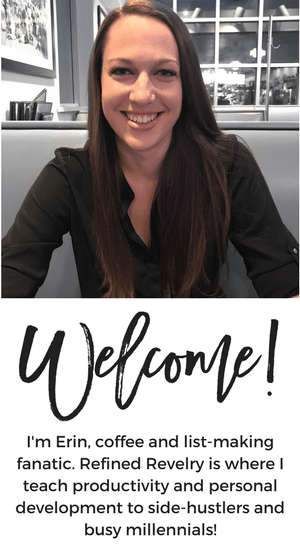 Limit Distractions: These days there are so many distractions that provide mental clutter, especially if you’re running an online business where being on social media and consuming online content are part of your job. I definitely find this to be true of myself. For me, the best way to reduce this is to limit distractions as much as possible. 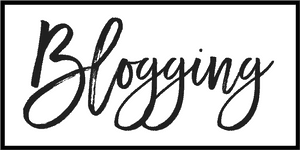 This means not checking my phone constantly, not having social media open when I’m working on anything other than social media, and limiting the amount of content I consume from other blogs. This also means limiting other mental distractions when you’re trying to work. For me, this means I never have the television on when I’m trying to focus on work and avoiding anything else like podcasts that might pull my attention away from the task at hand. Clear Your Head: As if there aren’t enough mental distractions with things like social media that are constantly trying to pull away our attention, there are also the thoughts buzzing around your brain to contend with. I tend to be an overthinker and can let something bother me for far too long, and sometimes this pulls my focus away from work as well. I’ve found strategies that work for me and allow me to clear my mind and regain my focus (those these may be different for everyone). Two things that have really helped me are journaling and meditation. When I keep circling back through the same thoughts over and over again, getting them down on paper is always a really effective way to clear my head. If you’re interested in trying meditation for the first time, or picking it back up again after having previously tried it, I love the guided meditations through the Headspace app! 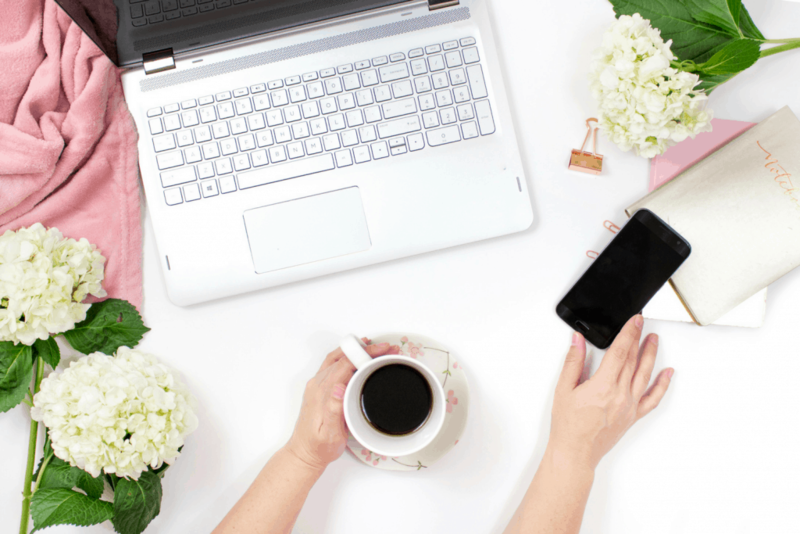 If you’ve tried to stay productive in a cluttered workspace, you’ve probably figured out for yourself pretty darn quickly that clutter can be a BIG productivity killer! Whether it be digital, physical, or mental clutter, it’s time to get rid of it.